cheese | An adventure with food. We love swirls. Sweet or savoury, they are an easy way to make eye-catching office munchies or a traybake to share at a party. These swirls are a take on a recipe from the Smitten Kitchen cookbook, which we handily ‘borrowed’ from G’s sister on an extended (never-ending) loan. Oh well. More time to bake all of the deliciousness. Makes 24 perfect for sharing or 12 as more of a substantial lunch. Begin by making up the dough. Sift the flour into a large mixing bowl, add the salt to one side of the bowl and yeast to the other. Throw in the sugar and pepper wherever you fancy. Pour in the melted butter, add the milk and mix well, then continue to add the water more slowly until you reach a slightly sticky-consistency dough. Throw out onto a lightly floured surface and knead for around ten minutes. Leave to prove in an oiled bowl until doubled. Meanwhile if you fancy, you can begin grating the cheese and the onion into a bowl. When the dough has proved, tip out onto a well-floured surface and roll out to approximately 48 cm x 30 cm if you want many to share, or 36 cm x 30 cm if you want them more for a substantial snack. Brush on a little melted butter to help everything stick before spreading on the mustard. Season well. Sprinkle on the cheese and onion evenly before rolling towards you, along the 48 cm or 36 cm edge, to make a tight roll. Cut the roll into 24 x 2 cm slices if making them to share or 12 x 2.5 cm swirls if making them for lunch. Line one or two deep baking trays with baking paper (depending on how many you’re making). Fit 12 swirls snugly into the tray – obviously if making 24 smaller swirls, you will need two trays. Leave to prove for around an hour in a warm place until the swirls are merging into each other. Bake for 20-25 minutes at 170*C until golden brown. Whilst they are still hot, mix the chutney with the water in a small glass or bowl. Brush the tops of the swirls with the glaze to give a wonderful sticky shine that makes them look irresistible. I decided (rather belatedly) that it should be my new year’s resolution to make sure I a) cook and b) blog a recipe once a week. So, I’m kicking off the year by using up the leftovers from our Christmas cheeseboard. We actually had so much cheese this year that we had a designated shelf in the fridge assigned to cheese. I would probably serve these with salad, chutney and maybe some more Granny smith apples if you have any left. Make the dough by mixing the flour, butter, salt and yeast in a bowl with around 160ml cool water. The dough should be slightly stickier than you would usually work with. Work the dough in the bowl for a few minutes to stretch the gluten and when it is less sticky, turn it out onto a lightly floured surface and work for 5-10 minutes until soft and elastic. Leave to prove for 2-3 hours until doubled in size. Meanwhile, crumble the stilton, roughly chop the walnuts and chop the apple into very small cubes for the flatbread filling. Drizzle with a teaspoon of lemon juice to stop the apple from discolouring, add a pinch of salt and pepper. Knock back the dough and divide into 6 portions. Shape each into a ball and roughly flatten. Place a spoonful of mixture into the centre of each disc and pull the edges over the top to seal in the filling. Roll out to around 15cm diameter. Fry in a lightly oiled pan on a medium heat for 3 minutes on each side. Serve with salad and more apple. 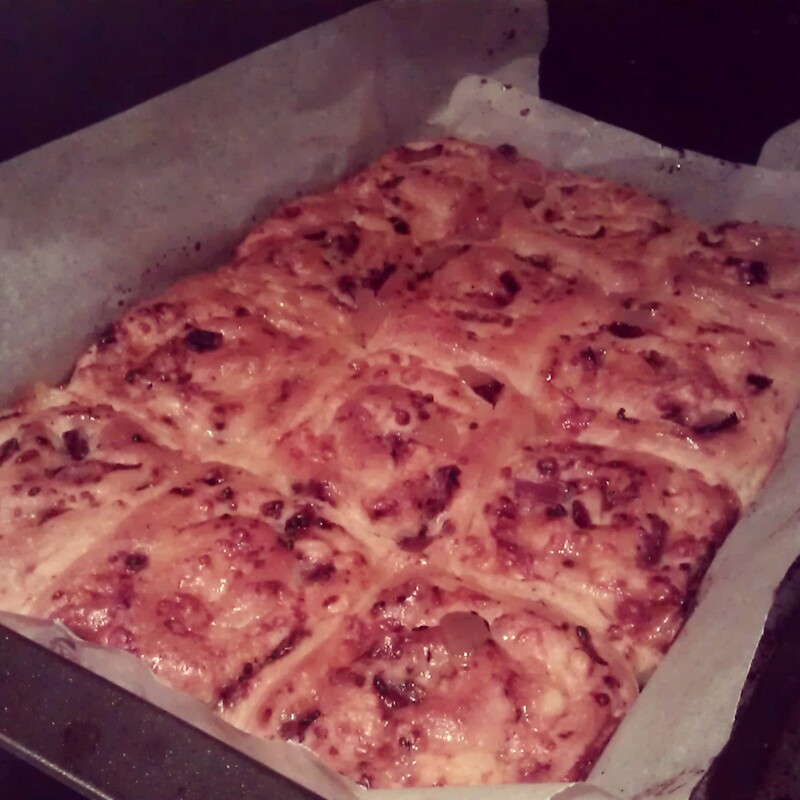 OK, I know, I cheated with the pastry. Sorry. But these are perfect for novice bakers who want to make something simple and home-made to impress. These will be a great offering to any festive buffet and they don’t take whole morning to prepare, which leaves plenty of time to concentrate on the piece-de-resistance (or enjoying a festive tipple). Grease a cupcake tin with some butter and plain flour. Roll out your pastry to the thickness of a pound coin and cut to roughly 7cm circles. Place in the tin and prick the bottoms with a fork. Bake for around ten minutes but do not allow them to brown. Remove from the oven when cooked. Meanwhile, chop the onion and fry in the oil it on a low heat for 2 minutes. When slightly softened, throw in the balsamic vinegar, sugar and herbs. Allow the sauce to reduce down and the onions should cook a little. Add in about 20mls of water and reduce again. The aim is to soften the onions but not brown them. When cooked, add a teaspoon of onions to each pastry case. 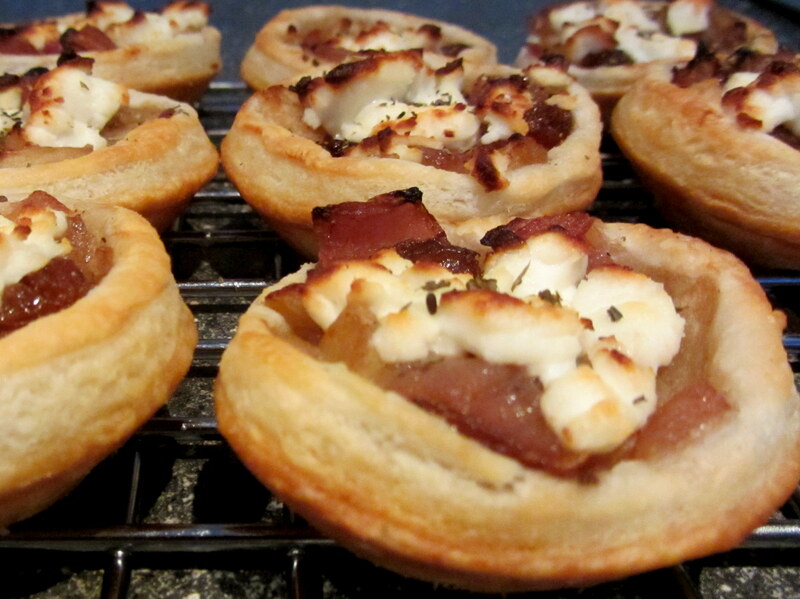 Crumble over a bit of goat’s cheese, brush the pastry with a little milk. Bake in the oven for around 8 minutes until the cheese is soft and a little golden brown. This is the ultimate store cupboard meal, but trust me, it does not disappoint. It keeps well for a couple of days if you want to split it into two small dishes and bake when needed. Just leave off the topping on the second dish to keep it crispy and fresh. 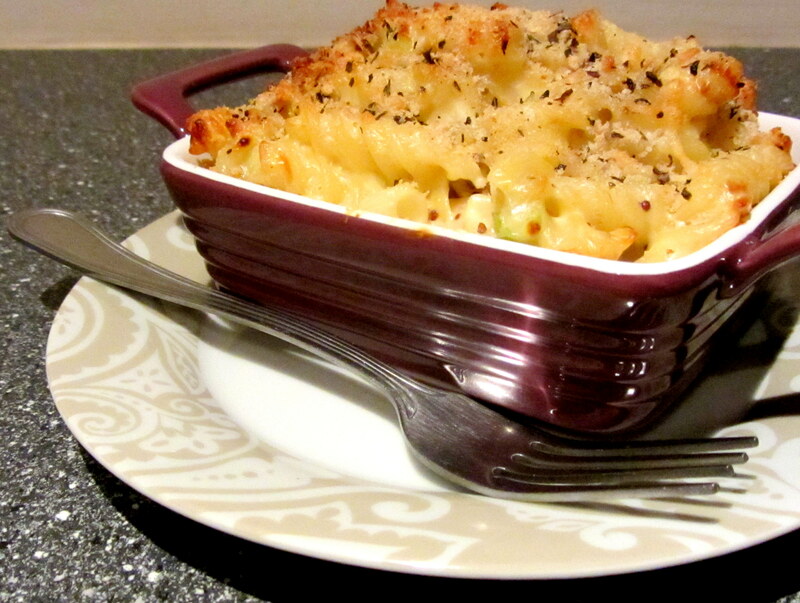 This cheese sauce is very versatile and can be used for cauliflower, lasagne…anything! Feel free to adjust the quantity of mustard (I am a huge fan), add bacon, ham, leave out the spring onions, add fried white onion, replace the breadcrumbs with crushed cheese and onion crisps – whatever you fancy! Start by cooking your pasta, standard rules apply – salted water, around 8-10 minutes. Meanwhile preheat the oven to 180*C.
Melt the butter in another pan and throw in the flour. Stir with a wooden spoon constantly to form a stiff ball (a ‘roux’ as they say) and stir for another minute. Take off the heat. Add a little of the milk (around 20mls) to the roux and stir to make a paste. Add a little more of the milk and stir to get rid of any lumps. This bit is very important – make sure you add the milk very slowly and beat out any lumps that appear. As soon as you feel the paste turn to a liquid, you can relax and add the milk a little faster. When all the milk is incorporated, put back on the heat. Stir constantly until it thickens – it should reach a consistency like custard. Remove from the heat, season well and grate in most of the cheese (leave a bit for the topping). Mix in the mustard well and ensure all the cheese is melted. Quickly slice the spring onions quite thinly. Fry in a little bit of butter until soft but not too brown. Add to the cheese sauce. Drain the pasta and mix with the sauce. Make up the topping by grating the rest of the cheese and mix with the breadcrumbs (or crisps) and herbs. Spoon into a dish, sprinkle over the topping and bake until golden brown. When in Bristol for the Jubilee weekend we had afternoon tea at a wonderful little café. It consisted of savoury and sweet scones*, with chutney and jam respectively. They were so bloody scrumptious we thought we’d attempt to replicate them. 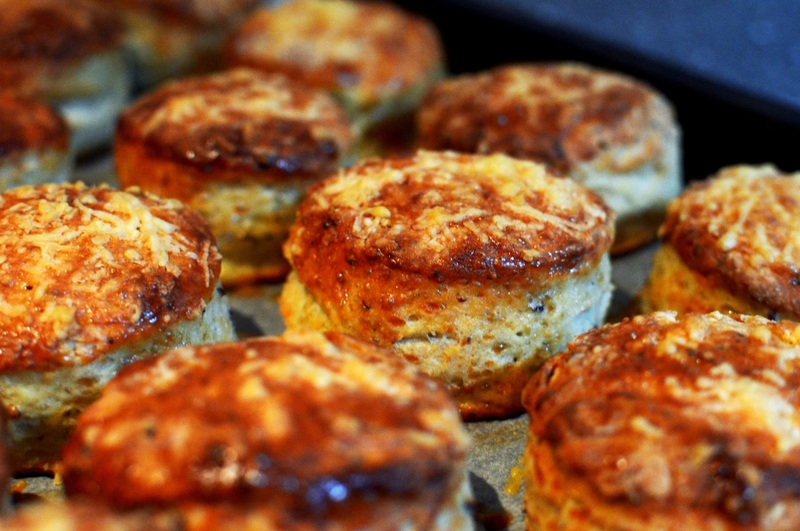 Here is the recipe for our savoury scones. 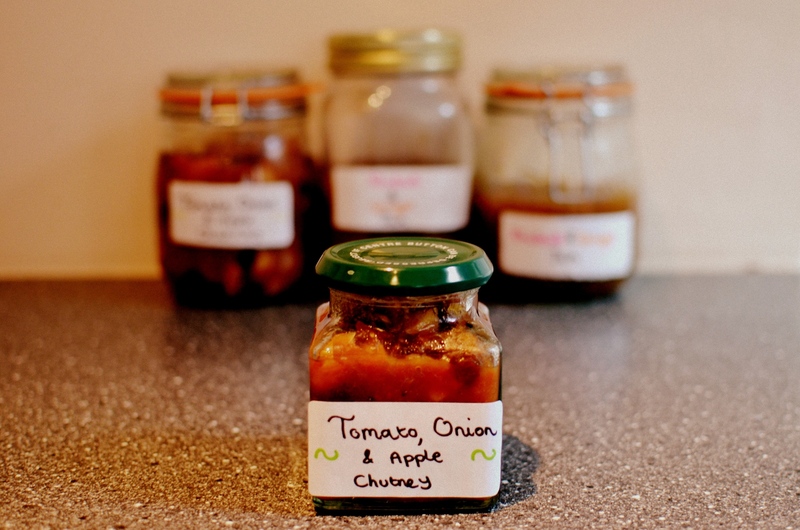 The corresponding chutney recipe is here, the sweet scone here and the jam here. Magic. Sieve the flour and baking powder into a large bowl. Add the butter and gently rub it in to form a light, sandy consistency. There should be no large lumps of butter. Finely grate in around 4/5 of the cheese (very precise I know – but just make sure you save a small amount for the topping) and add the mustard. Add around 100ml of milk and mix with a butter knife to form a dough. Slowly add the rest of the milk until you form a soft dough. Bear in mind that you may not need all of the milk, as you don’t want it to be too wet. Turn out the dough onto a lightly floured work surface. Roll out to around 5mm thickness. Fold in half and roll once, very gently, to stick the two layers together. Use a small cutter (ours was around 5cm diameter and made about 18 scones) to cut out the scones and place on a baking tray. Glaze the top and sides with beaten egg and sprinkle on the remaining cheese. Bake in the oven at 200°C for around 12 minutes until golden brown. Serve with your favourite cheese and a tasty chutney. *scONs to J, scOHNes to W. One day someone’s gonna lose an eye over this little disagreement.